Stories create change, inspire and produce clear emotionally engaging communication. Storytelling in business is an effective tool for engaging business communication. Learn the tips to change your business culture and create more engaging and effective presentations through the use of dynamic stories. Stories can change the way we think, act, and feel. As leaders we can use the power of a good story to influence and motivate our teams to new levels and heights. Stories can inspire understanding and action. A great story can create legends that shape the entire workplace culture, idea our people can build on. Stories can break down barriers, turning a bad situation into a good one. Stories, when told well, capture our imaginations and make things real, in a way that just the cold, hard facts can’t. From an early age we are brought up learning about the world and communicating through stories. They engage us, clarify our view and share our experiences with others in an understandable and engaging way. Yet when we communicate we often forget this heritage and try list facts and miss out on the richness and benefits of stories. You are not likely to get a good response from someone if you just list your activities and the times they occurred. “I went to the market at 11h07 and bought carrots, milk, honey, tea and rye bread. At 11h23 I filled up with petrol, got some chewing gum …” Yawn! Yet we often do this in business communication and presentations. We list ideas and procedures, sometimes with 10 mind numbing lines per slide and complex graphs, not putting them in context or communicating them in a way that engages our audience. Boring! Storytelling in business is very effective in increasing audience engagement and enable us to more effectively share our ideas and experiences. The brain has “mirror neurons” that enable us to vicariously experience what is shared in the story, as if it happened to us. We learn from our own experience, as well as the tales others tell us. We are far more likely to believe and remember information told in a story, than a list of facts or bullet points. A group of MBA students was given the same information in 3 different ways. A verbal description with facts and figures, a presentation with charts and tables and the third were told a story. The study found that, of the 3 groups, those told the story had the greatest recall of the information, though all were given exactly the same information. Not only did the story group retain more of the information, they also found the information the most credible! Discover how to make your message stick, inspire your people to change and create a positive work culture by learning the art of telling a business story. Concepts such as “share your knowledge” or “Go the extra mile for the customer” are rather vague until they are explained in a more concrete manner. The stories told by “Nordies”, employees at Nordstroms department store, clarify what they mean by “going the extra mile” – ironing a shirt for a customer or wrapping gifts bought at another store, for free. The stories told by 3M employees or by the World Bank of the benefits of sharing knowledge have helped change the Knowledge Management culture of the organisation. Stories are wonderful as a tool for helping people understand the ideas hidden behind the slogans and jargon, translating it into “Aha” moments and specific repeatable action. A business culture is made up of the stories people share and live. Motivating people to become problem solvers by telling the stories of people in your organisation who have creatively and successfully solved customer’s problems works wonders, rather than repeating the stories of their failures and how useless they are. If your success and problem solving abilities were acknowledged, would you repeat them? 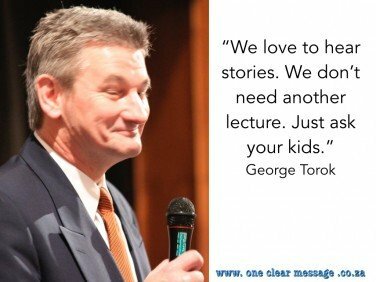 Storytelling in business helps increase retention and impact of our message. It is also not as boring as a list of facts and figures. One Clear Message Consulting Copyright © 2019.